Since the Greatest Generation’s “Golden Age” taxes ave gone down for corporations and up for the poor. But from the perspective of the [Elizabeth] Warren wing of the party, corporations pay far too little as it is, so making any plan revenue neutral is a loser. Before companies managed to start gaming the system, Warren noted, three out of every ten dollars of federal revenue came from corporate taxes, today it’s only one in ten. 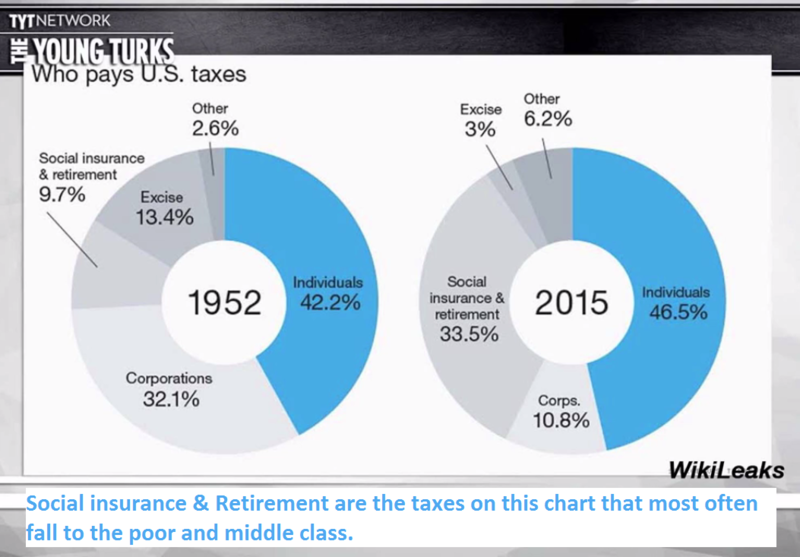 Then he dropped this chart that shows how the tax burden in this country has shifted from corporations to the working class. Social insurance and retirement includes the Payroll tax, and it has tripled since 1952. Meanwhile corporate taxes are a third of what they once were. Want to find out how that happened? Watch The Young Turks video below. In the video, host Cenk Uygur is cheerleading Elizabeth Warren’s one-woman battle against corporate tax holidays. A clear, simple argument. However, side affects of watching this video include rage, hair pulling, compulsive blogging, and sharing the above chart on social media. I just wanted to pull that screenshot out, to make it easier to share on all the social things.